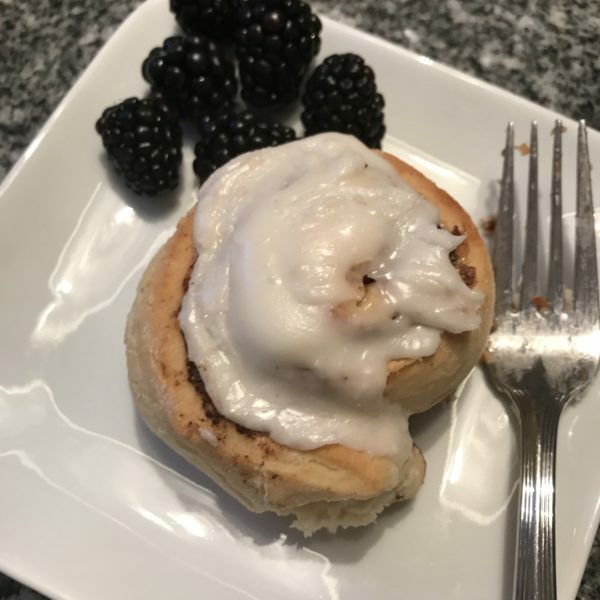 With swirls of airy dough and fragrant sweetness topped with a thick, vanilla-y icing, Homemade Overnight Cinnamon Rolls taste of sweet love and relaxed mornings. It’s been months since we moved, but boxes stubbornly remained around our house until recently — a reminder that we’re still making this our home. Little by little, the paintings, pictures and decorations unearthed give each of the rooms a sense of lived-in warmth. And as I look around, I can see the things I still want — the reading chair near the bookcases. The cozy armchair in the living room. The rustic farmhouse table in the dining room, surrounded by mismatched chairs. When I was 24 and the new owner of a house, I had no idea how to decorate a home. Driven by fancy and the pressure of how I thought adult things should be, I couldn’t quite grasp how to piece together furniture and objects to make a room look complete and cozy. Nothing ever felt quite right. A decade later, setting up house in Maine, I focused more on utility. In our small, right-sized apartment I merely wanted our home to serve its purpose with places for homework, entertainment and eating. It did. Our new home has been a grand opportunity for me. Cozy isn’t an abstract concept anymore. Now I see how form and function come together to create that ideal of cozy. I understand how choosing items is an intimate and important process, not one to be undertaken almost flippantly as it seemed when I was 24. So though I see the things I still want to do, I’ve hit pause until I am sure I find the ideal chairs, the right table, the perfect everything. I can wait. I have time. And in the meantime, I dealt with those boxes — sort of. Part of me wished they would just unpack themselves. Or disappear. Either would be fine. For now, they’ve been relocated out of sight. It’s amazing how doing so frees the mind too. That’s a comfort in of itself. But a home is more than where you put things and how you decorate it. It’s how you live in it too, and how you flavor the air with sweetly scented candles, lovingly cooked meals or even cleaning products, I suppose. I’ll stick with the meals. I love the scent of something baking — cookies, brownies, cakes, whatever. And cinnamon rolls, which are delightful with their swirls of airy dough and fragrant sweetness topped with a thick, vanilla-y icing. They taste of sweet love and relaxed mornings. 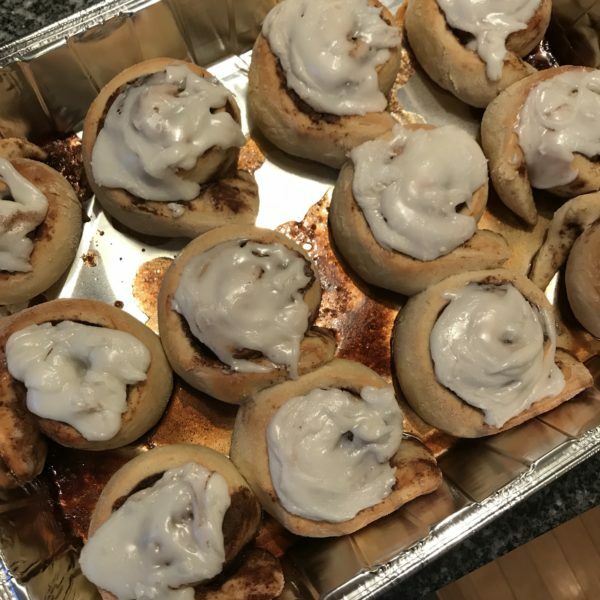 Like these Homemade Overnight Cinnamon Rolls. The dough starts with hot milk. Mixed with sugar, salt, butter and yeast, it becomes the basis for the dough, giving it rise and lightness. Flour is mixed into the liquid, forming a crumbly dough. Once kneaded, it becomes elastic. Then it must sit to rise. Doubling in size, the dough is airy and light. 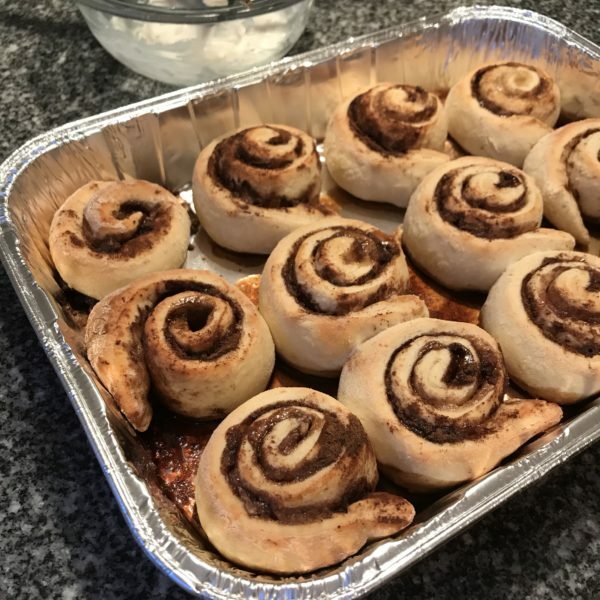 Once rolled out, it’s topped with light brown sugar and cinnamon. 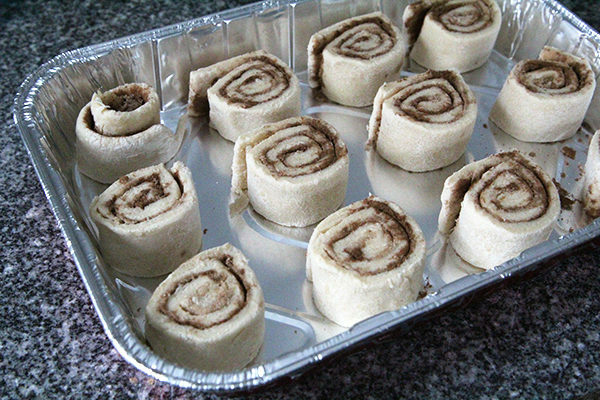 Rolled into a log, the cinnamon rolls are formed and cut into pieces that you arrange in a baking pan. Cover and chill them overnight. Then it must rise again. Cinnamon rolls are the best. Heat the milk in a small pan to scalding (it should be just short of boiling -- it should have little bubbles). Remove from heat and stir together with sugar, salt and ¼ cup of butter (cut into pieces). Once the butter is melted, sprinkle the yeast on the surface of the liquid and allow to sit for 2-3 minutes, until it foams. Stir. Add the flour one cup at a time, stirring until combined. Turn the dough out onto a floured board and knead with floured hands until the dough forms a cohesive ball. Place the dough in an oiled bowl and turn to coat. Cover with a dish towel and leave in a draft-free, warm spot for 1½ to 2 hours, until it doubles in size. Turn the dough out onto a floured board and roll into an 8x12-inch rectangle. Melt the remaining butter and brush the dough with half of it. Sprinkle all over with brown sugar and cinnamon. Roll (on the long edge) into a cylinder. Cut into 1-inch pieces with a sharp knife and arrange in a 9x13-inch greased baking pan. Cover (leaving room for the dough to rise) and refrigerate overnight. In the morning, remove the pan from the refrigerator and let sit in a warm, draft-free place for about an hour, or until the rolls have doubled in size. Preheat the oven to 400 degrees. Bake for 18-20 minutes, until golden. Remove from the oven and let cool slightly before glazing. To make the glaze: stir together ingredients in a small bowl and spoon over the warm rolls. What a fantastic way to wake up.